Are we all going to get along? Sometimes we’re friends. Sometimes we find ourselves annoyed by those around us. But no matter what – we are a school community for the 2011/2012 year. So look around everyone, we better figure out how to work together! 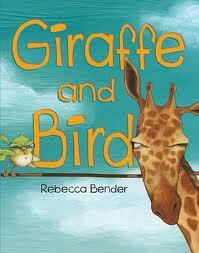 I appreciate Rebecca Bender‘s book Giraffe and Bird as it illustrates that being together is not always smooth and easy. 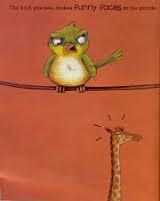 Giraffe and Bird irk each other and make no secrets about it. Bird makes funny faces at Giraffe. Giraffe invades Bird’s personal space. There is unwanted sharing of bad breath, frequent poops, annoying manners and swatting and pecking. Was he correct? Well . . . A storm happened and Giraffe and Bird found themselves longing for each other to hide near. “Oh Yeah. Oh Yeah. Was I right or what?” Hajhare started chanting. But then there is a big fight scene Tweet! Swat! Peck! Thudd! It wasn’t looking good. In the end, the author suggests that even though Giraffe and Bird assert they can’t stand each other, we, the readers, know better. Ricky summarized. “They’re friend-enemies. Sometimes it’s like that.” Sometimes it is. This entry was posted in Uncategorized and tagged bird books, favourite illustrators, fiction, friendship, great read alouds, making connections, picture books, Rebecca Bender by carriegelson. Bookmark the permalink.